The evening sky is crowded with bright stars and planets this week. Luckily these bright objects can be seen from almost anywhere, even in the middle of many bright cities. This weekend the planet Mars will make a close approach to the bright star, Regulus.The best time to look is right after twilight in the evening. 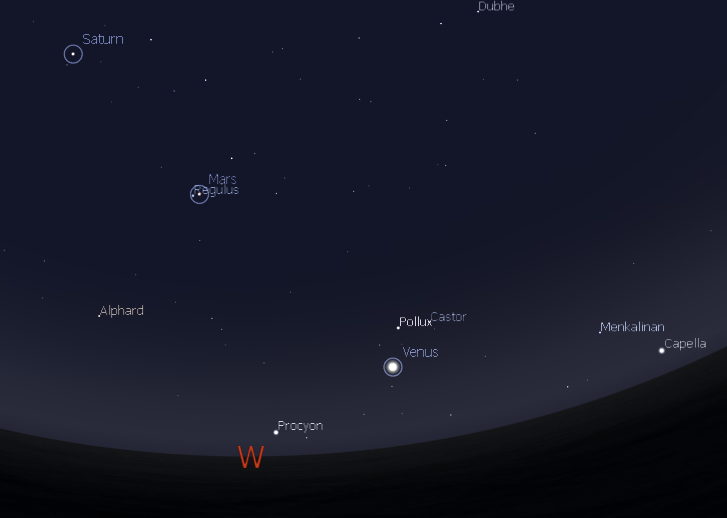 Watch Mars close in on and pass Regulus. Closest approach is this Sunday night at a little over 0.4 degrees. At magnitude +1.4 Regulus is about 20% fainter than Mars. Such a small difference in brightness will be hard to notice. More obvious is color difference with Mars red and Regulus blue. The brightest star in Leo, Regulus is about 3.5 times more massive and 150 times brighter than the Sun. While you’re out there take a peak at brilliant Venus, easily the brightest object in the sky. She will also have here own stellar companions this week. Watch as Venus passes just to the left of the 2 brightest stars in Gemini, Castor and Pollux. The 3rd evening planet is Saturn to the east of Mars/Regulus. Mars, Saturn and Venus will slowly close in on each other for a nice tight triple grouping early in August. The early evening view this weekend as Mars passes Regulus and Venus approaches Castor and Pollux. Created with Stellarium.